My reading life has been funny lately. The past few weeks have been busy. Every time I think "today is the day I curl up with my book for more than my lunch break or the 15 minutes before I fall asleep" I get sidetracked or distracted by things like cleaning...cooking...laundry. Plus, there have been a lot of activities going on and I'm finding myself a bit ADD when it comes to what I'm reading. One day, I'll read book x, the next I'm reading some of book y, etc. I know a lot of people read this way regularly and on purpose, but I've not done that for a while. I think it's a response to not having as much time as I want to read. I'm trying to read ALL THE BOOKS at once. But it's making me a little crazy. I did read a Kristan Higgins book I hadn't yet: Just One of the Guys. I think it's one of her better ones, with a unique heroine, big family dynamics, small town charm, and an I'm-in-love-with-my-best-friend kind of romance -- sweet but with just the right amount of sizzle. I'm in the middle of reading The Walking, by Laleh Khadivi. It's about two Kurdish brothers from Iran, set right around the hostage crisis in 1979. So far, I'm entranced by Khadivi's beautiful writing, and her ability to tell a small part of the story of a people, through the experience of these two young men. Oh, and I just finished a non-fiction book (very rare for me, I'm not going to lie) How Israel Lost the Four Questions, by Richard Ben Cramer. Pretty interesting stuff. The author (a Pulitzer Prize winning journalist) has an easy way of presenting his points and telling the stories of the people he talked to. One benefit to reading a book written by a journalist: he's not unnecisarily wordy. Cramer comes off a little sarcastic and smug at times, but he very clearly illustrates how the conflict in Israel and Palestine is both complex and simple at the same time. And while at times he seems a little biased against Israel, it seems to me that it's because he sees a country he grew to love turning into something he doesn't recognize. It's a frustration born out of love and high expectations. Waiting in the wings is Swimming at Night, by Lucy Clarke. I don't know much about this book, except that it's about sisters and it was written by the friend of a friend, so I'm looking forward to it. So that's what I'm reading these days. 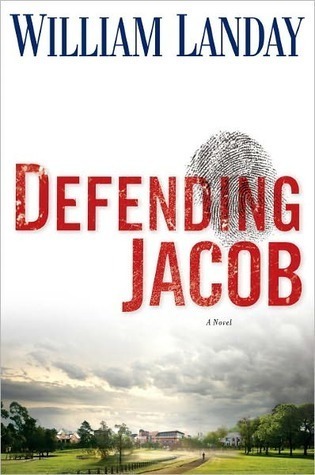 Defending Jacob, by William Landay is a fast-paced legal mystery. It was a book club pick, and generated quite a lively discussion about being a parent, what it means to support your children, and the classic comparison of nature versus nurture. Landay, a former attorney, is skilled at creating legal drama without letting the book get dry or heavy (fans of John Grisham would definitely enjoy this book). In addition to the tight writing, one of the book's strengths is in its narrator -- Andy is an assistant district attorney -- professional, experienced, expert. He narrates with the confidence of someone who is just giving you the facts of the story, someone who is used to being right. The thing is...Andy's pretty biased in relation to the story he's telling. You have to read between the lines to try and figure out what's going on, and even then...how sure are you? This is certainly a plot-centric book, but with well-written characters to give it more depth. Sixteen Brides, by Stephanie Grace Whitson is a pleasant post-Civil War story about sixteen women -- mostly widows, with one divorcee -- who sign on with a company promising to help them secure land grants in the Nebraskan territories. When they find out that their guide to the territories is really trying to sell them off as brides, several of the women band together in the tiny town of Plum Grove, Nebraska to hold on to their original dream -- freedom, independence, and land of their own. Adventure, discovery, and romance ensue. I have a soft spot in my heart for Western romances -- I think it's the Missouri girl in me -- and I enjoyed meeting the residents of and newcomers to Plum Grove. I was inspired by their adventuresome spirit, by the way they fought against society's expectaions, and by the way they determined to make a life for themselves. My only complaint is that I wish Whitson had turned this into two or three books. I wanted more! 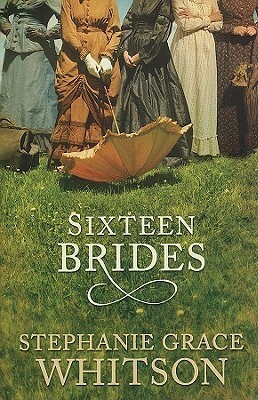 The book focuses on five of the "sixteen brides," and I think the ladies got a little short-changed. There wasn't room for the kind of development the stories needed, and you ended up with a lot more "tell" than "show." Both of these books were light, quick, enjoyable romances. 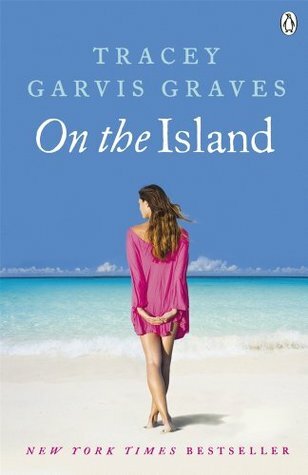 On the Island came across my desk at work and had an interesting premise, so I decided to investigate it (after all, I need to know which of my patrons to recommend it to!) so I took it home and flew through it in a weekend. Arranged caught my eye on a list of new women's fiction, it had a very intriguing premise, and it was available to check out as an ebook from my library. Since it was the premise of each book that caught my eye, here's a couple of very, very brief summaries: On the Island: a high school boy and his tutor are stranded on an uninhabited South Pacific island when their plane crashes on the way to meet the boy's family for the summer. Arranged: fresh off heartbreak, Anne Blythe (yes, named after my favorite heroine) calls what she thinks is a dating service but is actually an arranged marriage service. She's ready for marriage and burnt out on falling in love...is it worth a shot? On the Island: I was curious if this book was going to end up being....weird and/or gross. I mean, we can see where it's going right? But kudos to Tracy Garvis Graves for taking what could have been weird and making it into a survival story with a sweet, gradual, organic-feeling romance. First off, there's never any kind of tutor/student relationship that devleops. That's the set-up, but because the plane crashes the reality is during good chunk of the book the characters are just trying to survive and holding out hope that rescue will come. They're allies and friends, and come to depend on each other in a very basic, human way. In a you're-the-only-thing-keeping-me-from-going-crazy-we're-in-this-together kind of way. Slight spoiler: and you know, after two and a half years -- especially two and a half years of basic life or death survival -- T.J. isn't a boy anymore, he's a man. I completely bought that, and Graves did a good job in that development. The love between T.J. and Anna grew very slowly, and very naturally. My biggest complaint with this book is that it felt kind of emotionally flat, almost journalistic in its tone. But on the other hand, that tone may have kept it from feeling too melodramatic. Bottom line: if you aren't squicked out by May-December romances, give this book a try. 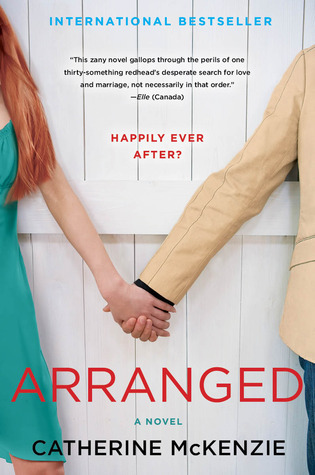 Arranged: I'm much more conflicted about this book. I was really excited about the premise of people forgoing modern dating in search of marriage and family and relational stability. I completely agreed when the company psychologist pointed out that lasting relationships take work and commitment and friendship, and that "falling in love" can sometimes set us up for dissapointment when that early relationship-rush fades. When it comes to long-term commitment, love is a choice. (Some days it's easy and glorious and you are 100% "in" love. Some days...not so much). Plus, the main character's mom is obsessed with Anne of Green Gables (the author is Canadian, by the way), so there are a TON of AoGG references in the whole story. LOVE. (relevant digression: there's a scene at the end where not only does Jack send Anne a pink enamel heart on a gold chain , but he quotes Gilbert in Anne of the Island as he's trying to win Anne back. Sa-woon. It's impeccibly done). I liked the main characters and even the supporting characters, who were relatively minor but completely sold every scene they were in. I was rooting for the couple to fall in love and make it work. BUT...I felt like this really original premise devolved into a very predictable romance -- guy and girl meet (albeit in an unconventional way)....guy and girl fall in love...girl find out that guy made a huge mistake and was lying to her the whole time...guy is genuinely sorry and tries to make amends...etc. It's not that I haven't enjoyed books (and movies) with that plot structure in the past, it's just that I was expecting something different. Bottom line: a fantastic, Anne of Green Gables-referential romance...as long as you're okay with a slight let-down. 1. Finally got around to reading Birds of a Feather, book two in the Maisie Dobbs series by Jacquelyn Winspear. I love these books. Read them if you like post-WWI fiction, classic detective mysteries, descriptive (but not flowery) writing, layered characters, strong female leads, anything English. 2. Our book club had the most interesting and lively discussion we've had in a while last night, talking about the book Defending Jacob, by William Landay. It's a mystery-thriller with a somewhat unreliable narrater, a lot of questions, and not very many answers. Two words: nature vs. nurture (is that three words?) One member called it "haunting." Everyone (except me, because I've only been able to read it on lunch breaks) read it in two days. It's compulsively readable and fast-paced. 3. It's starting to warm up outside, which means it's time for iced coffee! Mmmm...iced coffee. With lots of milk. 4. Post-vacation I'm wanting to read books about/set it the Middle East (starting with Israel) -- fiction and non-fiction. But I'm overwhlemed because I want to read ALL THE BOOKS RIGHT NOW. 5. So it's time for another season of Ultimate Frisbee Spring League. Something about playing Ultimate makes me in the mood for a beer, so Sunday I had the most healthy dinner ever: french fries, beer, chocolate chip cookies. Makes me think of high school, when I'd eat a post-volleyball dinner of a McDonald's chocolate milk shake and large fries. 6. Can you tell? French fries are my kryptonite. This book hit just the right notes for me. Set in 1970s Ireland, the book shares the story of a young doctor in his first job as the assistant to a small-town general practitioner. I'm predisposed to love anything set in Ireland, and the setting did not dissapoint, Taylor painted a clear and loving portrait of the country and of its small towns. The story moves at a leisurly pace, but to me it felt comfortable. There was a heavy emphasis on the medical stuff in the book -- the book is genuinely about a doctor -- which could be a turn off to some, but I enjoyed it. This is a very character-driven, slice-of-life kind of book and sometimes that's just what I'm in the mood for. Bottom line: I'm definitely checking out more from this author. 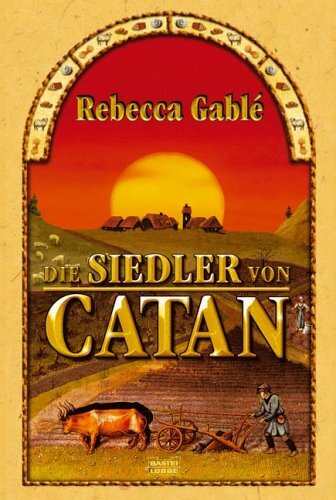 Unfortunately, I don't speak German, so I read the English translation of Settlers of Catan, but I kind of love this original German cover. Settlers of Catan is, in fact, inspired by the board game of the same name. I was expecting an entertaining, campy fantasy. In reality, it read more like wonderfully done historical fiction centered around the Vikings (although, the setting and story were definitely made-up, I think the culture portrayed was obviously well-researched Viking-inspired). Overall, I really enjoyed this book. It was a strange combination of slow-paced with a what-happens-next readability -- the most boring book I couldn't stop reading. Like tubing down a lazy river, but never wanting to get out. The author explored issues of family, community, leadership, slavery, and religious freedom. The conflict between the community's old gods (Thor, Odin, etc.) and the growing presence of Christianity was particularly well done, and a good setting for smaller, more interpersonal conflicts as well. In addition, the character development was really fantastic. Candamir in particular was an extremely nuanced, layered character, but really all of the characters were fully three dimensional. Bottom line: a superbly written historical fantasy for those who don't mind a long slow journey.